Suunto has got in on the CES 2018 action by announcing the Fitness 3, its latest sports watch that's all about building training plans that adapt based on how much (or little) workout time you put in. Design wise, the Fitness 3 looks like its cut from the same cloth as Suunto's Spartan Trainer watches with the option of gold or black-plated stainless steel bezels and pushers. There's five models in total; gold, ocean, sakura, all black, and gold and all black. There's an optical heart rate sensor on board, and if it's anything like the one on the Sport Wrist HR and the Trainer Wrist HR watches, it should be a solid performer at pumping out reliable BPM data. In terms of tracking, there's sports modes for running, swimming, cycling and gym training. There's no details of built-in GPS, with walking and running set to be tracked using the built-in accelerometer to deliver speed, pace and distance details. The big feature here though is the adaptive training mode. You'll be able to build seven-day training plans based on your current fitness level and exercise history. If you happen to miss a session down in your plan or you end up working out more than you were supposed to, the training plan will adjust accordingly. It's a kind of feature we've seen from Polar with its Running Program, so it'll be interesting to see how it works on Suunto's watch. Other features include real-time guidance for heart rate zone training and 24/7 activity tracking with sleep monitoring to help assess recovery time. On the smartwatch front, there's support for calls, texts, and calendar notifications. All of your data will of course be synced to the Suunto companion app, which is getting a makeover and will roll out in the spring. 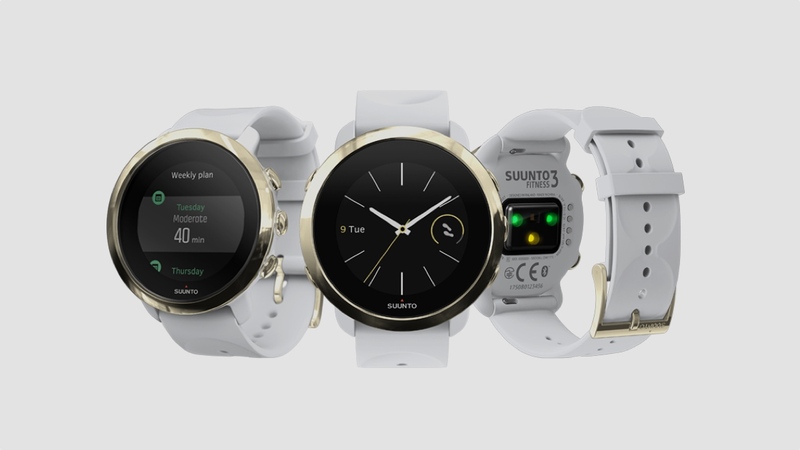 The Suunto Fitness 3 will set you back €229 (approximately $270 for the gold and all black version, with the black, ocean and sakura models available for €199 (approximately $237). There's no news on when it'll be available, but we'll keep you posted when we know more.